Color the drawings of the jewels and jellyfish. Then practice writing some perfect Js. 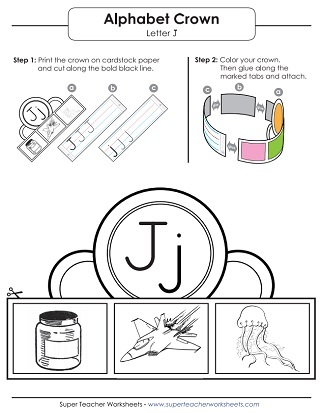 Wear this jazzy hat after coloring in the pictures of a jet, a jar of jam, and a jellyfish. 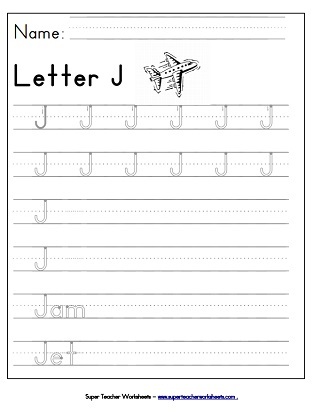 Trace the dotted lines on this worksheet to practice writing lower-case j. This is another activity to teach writing lower-case j by tracing the gray lines. Follow along the dotted lines with your pencil to learn how to write capital letter J. By tracing the gray lines, students will practice writing capital letter J. After students practice writing upper-case and lower-case J, they can draw a picture of a word that starts with J. Print this worksheet for your students to help them learn letter recognition. Dab the circles in the shape of letter J with colored ink daubers.